These sensory integration red flags may indicate that a child needs extra help or support to manage sensory processing concerns. We’ve been working hard over the last year to bring you monthly posts about sensory processing and how the sensory systems relate to child development. Each month, we’ve written a post about one of the sensory systems from our point of view as pediatric therapists and our friend Dayna, from Lemon Lime Adventures, has written a post about the same sensory system from her perspective as an educator and a mom of a child with sensory processing disorder. In this series of child development resources about sensory processing, we’ve written about the tactile system, the auditory system, the proprioceptive system, the vestibular system, the oral sensory system, and the visual system. 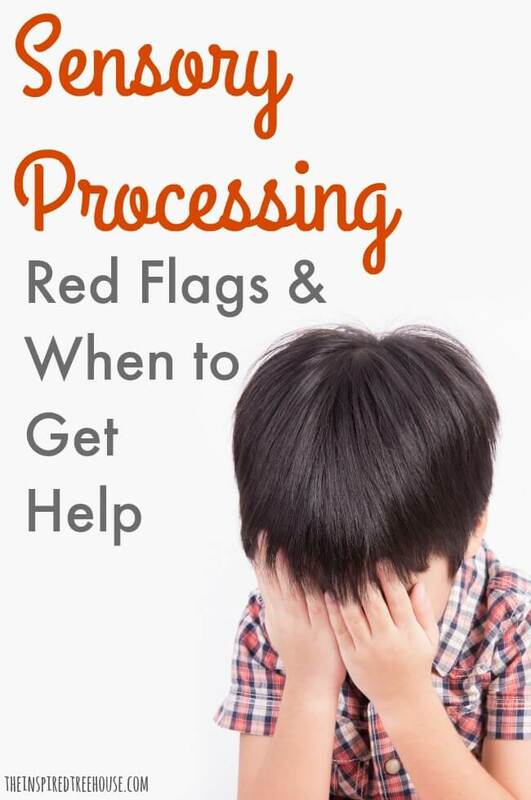 Today, as a part of an even bigger series with over 40 other bloggers called Decoding Everyday Kid Behaviors, we’ll discuss sensory red flags – behaviors related to sensory integration that might indicate that it’s time to get some expert advice to help support your child’s sensory needs. We all have our own unique preferences and aversions when it comes to the way perceive the sensory information in our surroundings. 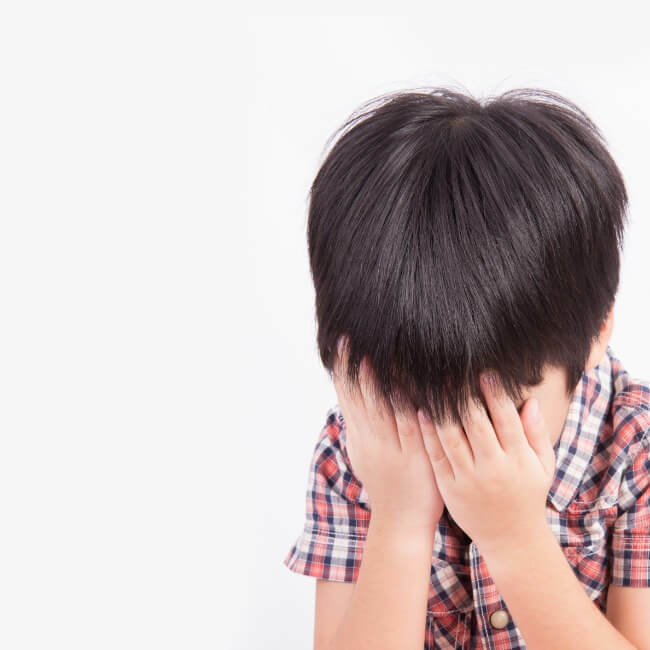 But for some children, these preferences and aversions can become problematic, leading to difficulty participating in everyday activities and routines. The following behaviors are sensory integration or sensory processing red flags and may indicate that a child requires additional support. -Easily distracted by surrounding visual stimuli (e.g. posters or art on the walls, activity in the room). Talk to your pediatrician about getting a referral to an occupational therapist who is trained to evaluate children’s specific sensory needs, provide therapeutic intervention to address them, and give you sensory strategies and suggestions to use at home. All children process the sensory information they encounter in their own unique ways. Every child needs exposure to a wide range of sensory experiences for healthy development. We can support the sensory needs of all children through engagement in playful sensory activities and through exposure to materials that appeal to all of the sensory systems. The Sensory Fix Toolkit from Project Sensory was originally created for a child with Sensory Processing Disorder, but it is the company’s mission to help ALL CHILDREN get the sensory tools and experiences they need to be successful in school, at home, and in the community. The Sensory Fix Toolkit is a portable kit full of materials to provide a child with sensory experiences throughout the day. It comes with a year’s worth of downloadable printables too! Our favorite part of Project Sensory? 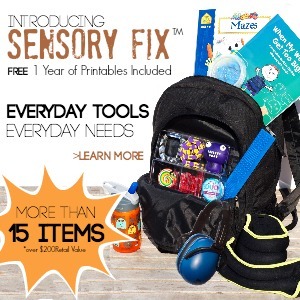 For every 20 kits they sell, they’ll donate one Sensory Fix Toolkit to a classroom in need! We LOVE the idea of bringing sensory activities and supplies into all classrooms to make sure that kids are getting the movement and tactile experiences they need to be successful as well as tools for calming and self regulation. Whether you are a parent, educator, caregiver, or therapist, Sensory Processing 101 is your starting point to gain a better understanding of sensory processing and the body’s sensory systems. -Sensory Resources: Resources related to sensory processing, including support groups for parents and caregivers of children who have sensory needs, cheat sheets with quick overviews of each sensory system, and more. My son is a seeker as well, with every one of the areas you listed. He has had private occupational therapists for years and a sensory “diet”, but it’s hard to implement at school and he’s starting to get into trouble for his silly, disruptive behavior. At his IEP update this week, we decided to try letting him stand at his desk while working on centers, and we will encourage him to ask for movement and brain breaks when he needs them. He can use a mini trampoline or take a walk down the hall. Hopefully he will remember to do that instead of being silly with inappropriate noises, giggling, spitting water in the cafeteria, etc. We will also make him a social story to read about making better choices and a positive reinforcement behavior chart shaped like his favorite thing in the world, an elevator! Please let me know if you have other suggestions. Thanks! Thanks so much for your comment. It sounds to me like you’re doing so many great things to support your son – from OT to a sensory diet to social stories to a behavior chart that appeals to his unique interests…you’ve really covered all of your bases! It’s so great to hear about a kiddo who is getting the help he needs because he has a mom who is “in the know”! Good luck to you and your son! Another great thing in the classroom with this type of activity is to use a large ball to roll their feet around and I would set a timer to finish work within a certain time frame..
this is very helpful information. My eight year old has a certain degree of SPD, but seems to be coping better than ever right now, except for a couple of things. She hates stickers and printed characters on clothing or bags etc. She goes so far as to ask her sister to button up her pjs all the way so she won’t see the printed dog on her vest, or asks her to turn the vest inside out! Also, not that we would make a regular thing of this, but one day we were at a family wedding and got the kids a deli sandwich before the ceremony so they wouldn’t be hungry. My girl actually wouldn’t eat the sandwich until we took the price sticker off, she said it made her want to retch, being in such close proximity to her food. She also demonstrates some behaviours like tightening her shoes so tightly that she bruises her feet and turning down the shower till it’s freezing but still insisting that it’s too hot. I spoke to an OT friend of mine who said that these sensory issues are quite common in children who are born prematurely as my daughter was. I’m looking forward to reading about more great strategies to deal with both my own child’s behaviours and possibly those in the classroom as I teach 9 and 10 year olds. Hi Susan! Thanks so much for taking the time to leave a comment. So interesting that your daughter has an aversion to stickers and printed clothing. I’m glad you’re consulting with an OT to help you get to the bottom of some of her sensory processing issues. And yes, these concerns are quite common for children who are born prematurely. We hope you find some helpful information and activities here at The Inspired Treehouse! My 12 year old son a very clear oral seeker – he chews his clothes if there is nothing else and he must ALWAYS have something in his mouth. And yes he is a VERY picky eater. He also has some auditory issues as well – sensitive to loud noises and jumps when a loud noise happens suddenly. when he was younger he had vestibular and proprioceptive issues as well. He was always falling over when he ran around. But he seems to have either grown out of those and learned to compensate, or he is no longer as clumsy as he used to be. However, even now, he does still occasionally fall over. again when he was younger, He was very sensitive to tactile – his clothes had to be a certainly type and he frequently wears his socks inside out so that the seams don’t bother him. The funny thing is that he has never been officially diagnosed. I reached this conclusion after reading a LOT of books. The Out of Sync Child was a huge eye opener!!! The one time I took him to a specialist pediatrician to be checked, they told me that he had signs of ADHD and to bring him back in a year once he started grade 1. I never bothered to go back since I knew that he dors not have ADHD. So I have had to create a sensory diet on my own. . So far he is doing OK. And not one teacher at his schools has ever suggested to me that his behaviour is a problem. He is also doing very well in school. I think he behaves himself in school so that he can just be himself at home. It’s a good thing he is an inly child!!! Thanks for a concise, well written article. I wanted to add that in our experience, it took longer to identify our daughter’s SPD due to her determination to hide her sensitivities while in public, building up to massive tantrums when she was home. Clothing sensitivity, constant oral sensation seeking and toe walking seemed like childhood quirks until she started to hit walls in Year 2. It was only then that she was diagnosed with significant auditory and visual processing disorders, and we began to understand the extent of the struggles she faced each day. It took a long time to deal with the guilt and regret for not picking it up earlier and for having dealt with her tantrums in a completely insensitive manner. I wanted to share this in case there is a parent out there who has that niggling sense that something is wrong, and yet their child’s ability to function makes them second guess themselves. Thanks again for a great article. Thanks so much for your comment Karen! We really appreciate you sharing your experience with us and our readers and we totally agree that parents should always trust their gut if they sense that something is wrong. So glad you were able to identify your daughter’s needs and get her the help and supports she requires for success! This is really helpful. I am a PT, although not pediatric, so I am somewhat familiar with sensory integration. I know my daughter inherited from me some higher level sensory needs. They have never really affected my daily life, and I found ways to compensate. I watch her for it interfering with her daily life constantly., and have read up on many techniques to help what limitations she does have. This article was really helpful to see my observations are validated that she is not really being affected by it too much at this point. However, I have contemplated taking her to an OT evaluation to see if there is anything they can give us to work on at home. i am in the beginning stages of this process with my son. hE PRESENTS WITH MULTIPLE RED FLAGS IN MULTIPLE SENSORY AREAS. hE SEEMS TO HAVE SOME CONTROL OVER HIMSELF UP TO A SPECIFIC THRESHOLD. iT CAN BE ONE EVENT THAT MEETS THE THRESHOLD OR IT CAN BE MULTIPLE EVENTS THROUGHTOUT THE DAY. i HAVE SAUGHT HELP FROM A PEDIATRIC PSYCHOLOGISTS, AND WAS REFFERED TO ot FOR sENSORY ASSESSMENT, BUT THE TESTING WAS SUBJECTIVE. iS THERE SOMEWHERE THAT PERFORMS OBJECTIVE COMPREHENSIVE SENSORY ASSESSMENTS? What may be the triggers? Could it be watching too much tv? How can we help him to get over this Humming we are really concerned. Hi- thanks for the article! My 5 year old fidgets with his ears to show emotions a lot. When he’s super excited or angry/frustrated. He is also a very picky eater- doesn’t like to try new things and doesn’t eat much meat (only nuggets). It’s difficult to pack him lunches for school and explain it to teachers who have food day. Any advice? Thanks! Mate all kids are picky eaters if they had there way they would eat chocolate for breakfast and for dinner it would be cracker so don’t worry to much he will eat meat when his older but a lot of kids prefer sausages. very helpful! The comments are helpful too because they are focused on a real child’s behavior. I wish I’d read this page a few years ago. Short, sharp, to the point and hits so many nails on the head. We are well and truly in the sensory world now but it was hard years ago when we were clueless. Thank you for compiling this list. I hope it helps a great many people, as it would have helped us. Hi, it sounds to me like your son may be demonstrating signs of autism. Have you had him evaluated by a behavioral therapist or spoken to his pediatrician about your concerns? Best of luck with your little guy! He makes so many noises, i didnt even know their was senory issues. He hums, chews on his cheek and his nails, clicks with a like sucking noise , make squeaky noises and does this sucking thing with his nose ( like hoarking snot) and sucking up snot says blowing his noise is too hard it hurts. Im really glad i found this article im going to talk to his doctor asap and his school, hes been diagnosed with adhd and has a couple learning disabilities hes also has an iep and emprowerment classes. he’s driving me insane with these noises. Did you find anything out? My 6 year old does many of the same things including the ‘hoarking snot’ as you mentioned. He also sings a lot, and has started making little humming noises. I never would have thought there was anything amiss until the frequent short humming sounds started. Interested to know if you found anything out. This article is very helpful. My son will be turning 3 soon and is so distracted by lights and sounds. We were in a preschool class today and a light bulb kept flickering and he was so distracted by it. He would get up and play with random things like the curtain blinds, the radio and look at all the things on the walls instead of what the teacher was doing. We will have to pull him out because he is so distracted. Is this sensory processing disorder, vestibular, or something else? He is very bright and knows his alphabet, colors, shapes, can count to 30, has a lot of words, knows the solar system in order and has an amazing memory. He just can’t seem to focus and sit still… and will cover his ears with certain noises. Please. Any advice would be great. Thank you. Hi, thanks for the great information. My son who is 6 has been, for about the last year or so, doing a lot of singing (making up words to songs he know), constantly talking, but seems sometimes just needs to make some sort of noise at all times. Recently he started making little humming noises when he watches a show, or when he’s laying down to sleep. Over all, not very many symptoms, but could the humming be indicative of more behaviours coming? Or a sign that he could have mild symptoms that are getting ‘worse’ or more frequent? Thanks!